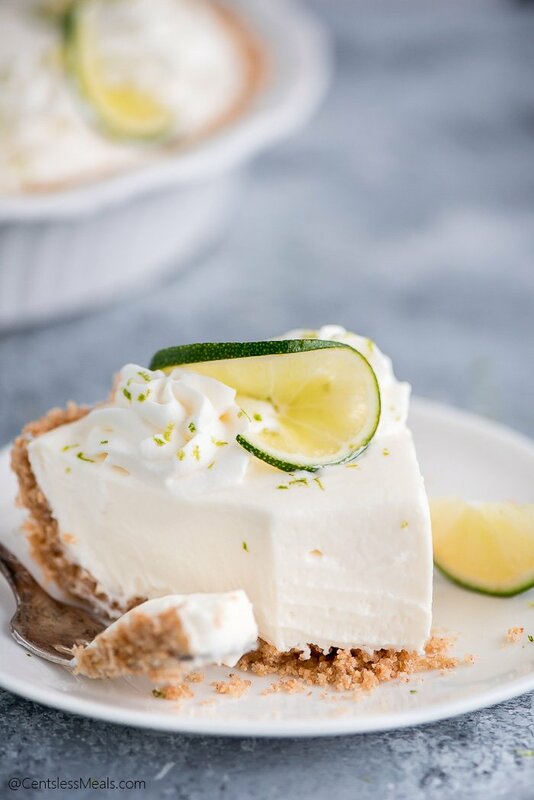 Key Lime Pie is a refreshing sweet and tart no bake dessert that is perfect for all your summer gatherings. 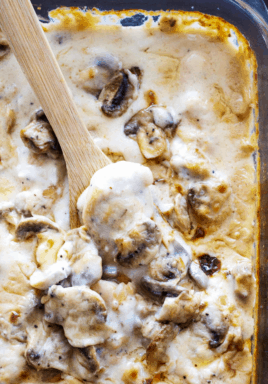 It’s easy to throw together and you don’t even have to turn on the oven! There’s nothing quite as refreshing and perfect for summer as citrus flavors like in this No Bake Key Lime Pie. 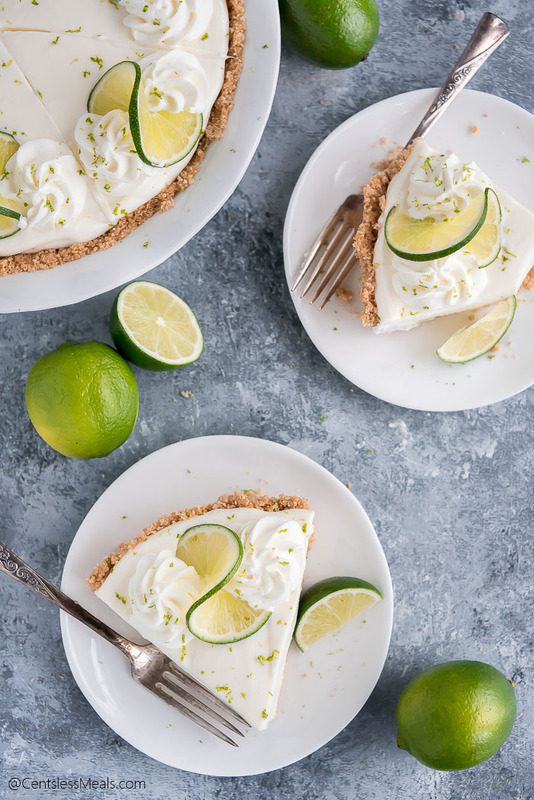 The tart citrus flavor of lime and lemon hits the spot and is especially great in desserts because the tartness is balanced by the sugar. You’ll start out by making your graham cracker crust. 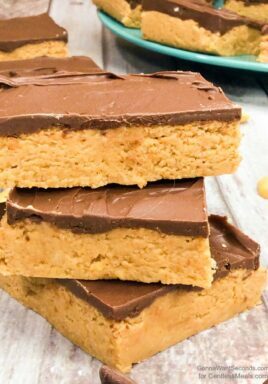 You can buy whole graham crackers and grind them up in a food processor or blender or skip that step by buying a box of graham cracker crumbs. Place in in the bottom of you pie dish along with with sugar and melted butter and mix it up until everything is nice and moist. Then you can pack down the crumbs onto the bottom and up the sides of the pan. Place the crust in the fridge to chill for 30 minutes. Next, you need to whip up your cream. You can do this using an electric hand mixer or your stand mixer with the whisk attachment. Whip it just until it forms stiff peaks. Plop it in another bowl and then add the room temperature cream cheese to the mixer but this time with the paddle attachment. You’ll cream this for a couple minutes until it’s nice and smooth and then your slowly drizzle in the liquid gold, I mean sweetened condensed milk. That stuff is good! Once that is mixed in you can mix in the lime juice and then fold in the cream that you whipped up. How easy is that?! Then you just pour the filling into the crust, cover, and let it chill for at least 4 hours or overnight. 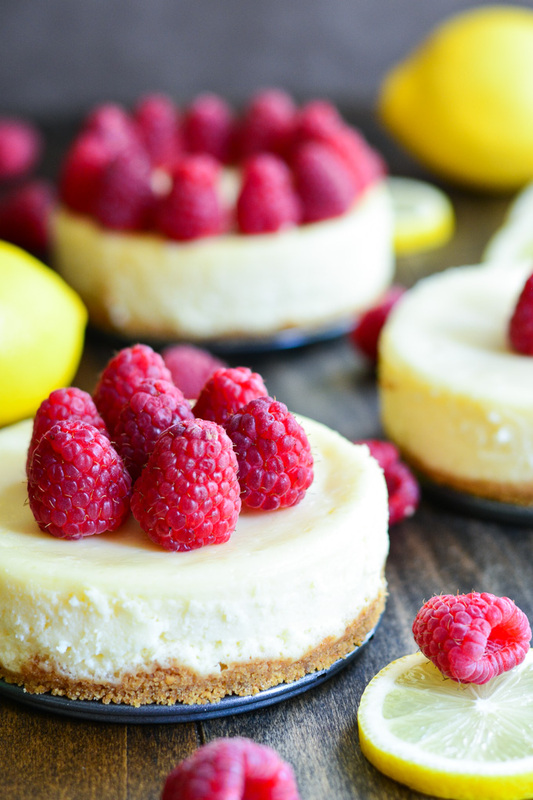 When you’re ready to serve it, garnish with some whipped cream, lime zest, and limes. 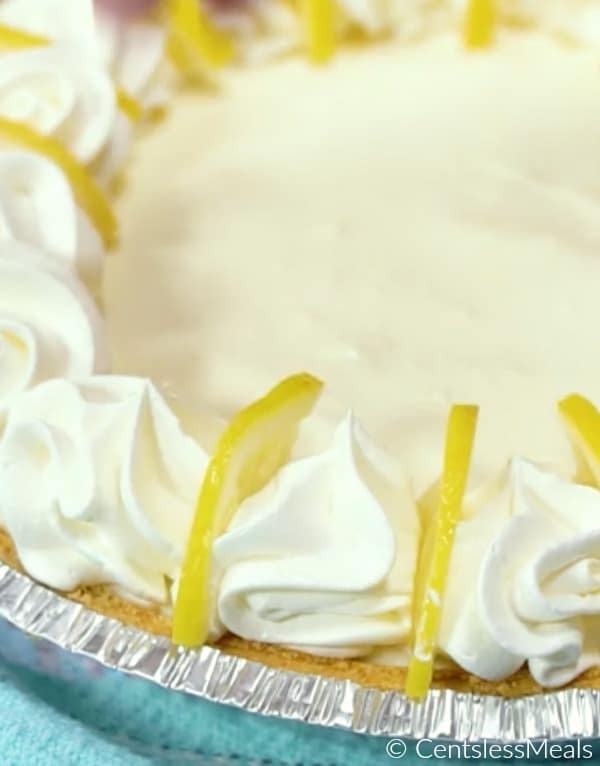 Unlike baked Key Lime Pie, this pie already has a lot of cream in it for balance the tartness so you won’t need to smoother the top with whipped cream. Just add enough for some finesse or just skip it. 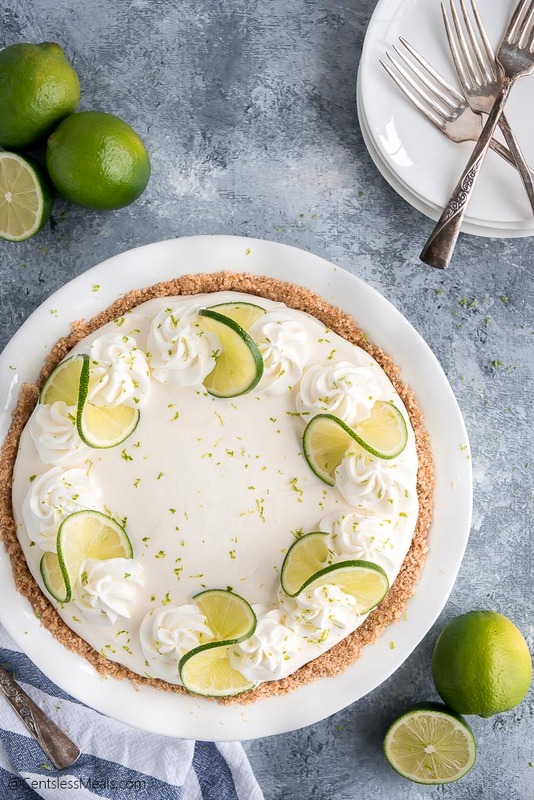 If you’re a fan of Lemonade or Cherry Limeade, I can guarantee you and your guests are going to love this pie. 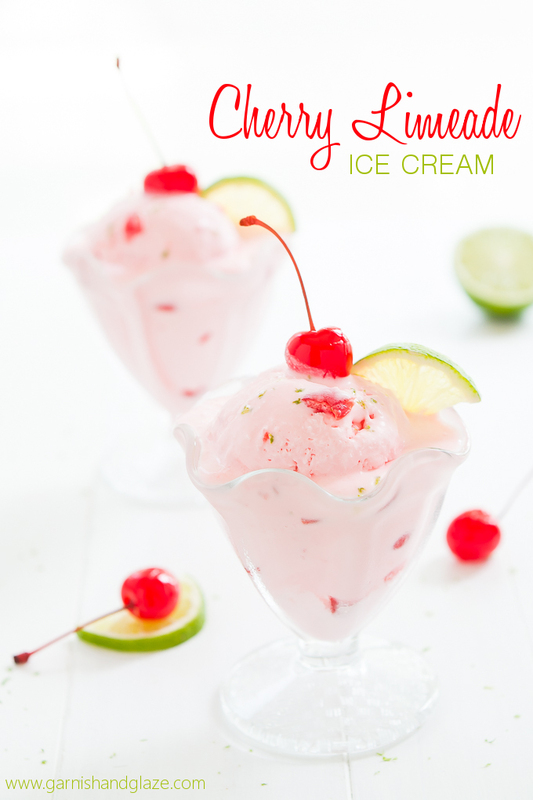 The combination of sweet, tart, and cream is one that is hard to pass up. Enjoy! 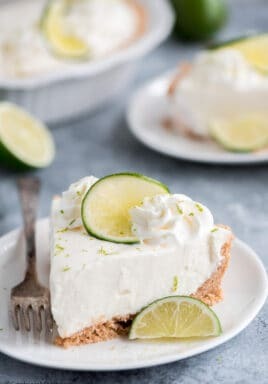 No Bake Key Lime Pie is a refreshingly sweet and tart dessert that is perfect for all your summer gatherings. Cream, sweetened condensed milk, cream cheese and lime juice are blended together to create make the perfect combination of sweet and tart. Mix graham cracker crumbs and sugar together in a 9 inch pie plate. Mix in the butter until everything is moist and then press into the bottom and up the sides of pan. Chill in the fridge for 30 minutes. Meanwhile, beat the heavy whipping cream in a stand mixer fitted with a whisk attachment until stiff peaks. Remove whipped cream from the bowl into another bowl. In the stand mixer (no need to clean out), beat the cream cheese for 2 minutes until creamy. 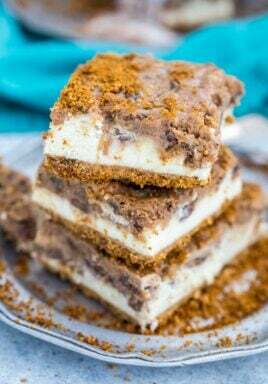 Stream in the sweetened condensed milk and cream until smooth. Add the juice and mix until combined. Scrape the bowl as needed. Add the whipped cream back to the bowl and use a rubber scraper to fold it in. Pour the filling into the chilled crust and smooth out the top. Cover with plastic wrap and chill in the fridge for 4 hours or overnight. 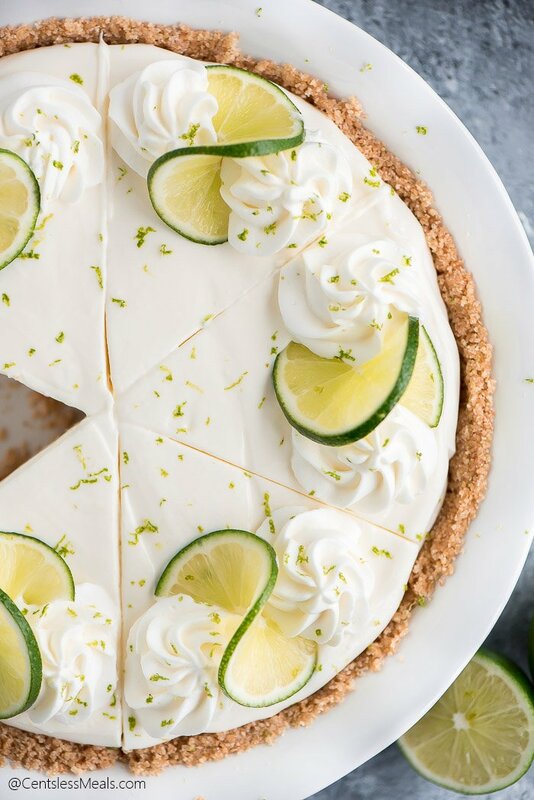 When ready to serve, garnish with whipped cream, lime zest, and lime slices. Slice and serve. Oh this pie sounds delicious! Finally had some as close to florida as we’ve gotten so far ftom canada lol in VA on the boardwalk at VA beach !! I was so excited..thank you for sharing this! You’ll love it Dena! Enjoy! Can this pie be stored in the freezer to serve at a later date? Looks so good! Of course! Though I recommend holding off on the whipped cream and topping it fresh when you’re ready to eat it.